Have an idea for a Desmos activity? Use Activity Builder to turn it into reality. Notes, images, graph screens, input fields... All the tools you see in the community-created activities at teacher.desmos.com are now at your fingertips. 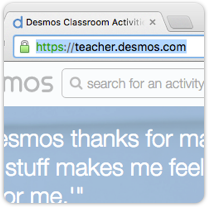 To create your own custom Desmos activities, head over to teacher.desmos.com. Scroll down to "your custom activities" and click "Create with Activity Builder" to get started. Add a title, build your activity screens, drop in a description, and you're ready to share it with the world!